What a year it has been. Almost a year ago to the day Steve and I met to discuss the idea of setting up our own company which supports young people and colleagues in learning and delivering a difficult GCSE PE course. Having both worked for Pearson, either writing resources for teachers or reviewing their specifications, we felt the resources that were out there did not underpin what the exam is about; understanding of command words, assessment objectives and content. So, we started to plan and wanted to create a resource that helped young people recall information, develop their understanding of command words and assessment objectives whilst being able to answer exam style questions as if we were sitting next to them. We wanted to create an independent, self-paced resource which incorporated 21st century technology. After a year of planning and many sleepless nights, it is with great pleasure that we introduce Smart Cards. Smart Cards are a fun and interactive way to learn or recap a topic. Smart Cards offer clear structure, as poorly organised knowledge cannot readily be remembered or used (Reif, 2008), and help learning and recall by using Retrieval Practice (RP). RP is the process of getting information out, and Smart Cards allow for challenging retrieval with the comfort of knowing any gaps in knowledge can be filled. The cards accurately cover all content from the Edexcel GCSE PE specification. There is a ‘blanks’ side to each card that tests pupil’s ability to recall information with an accompanying mark scheme. This allows students to reinforce content as they independently mark their own work and correct any mistakes made. 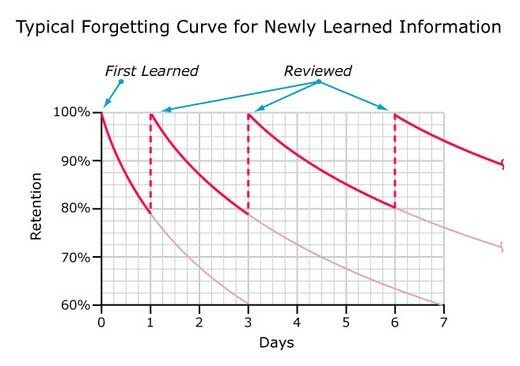 Ebbinghaus proposed that newly learnt information is forgotten as soon as 24 hours after learning it for first time. The image below is great to show parents and students to show the importance of reviewing at regular intervals. Smart cards in their very nature allow for review, but there are some additional opportunities inbuilt within our product. It is considered that testing yourself is one of the most effective ways of recalling information and helps you to check for any gaps in knowledge. Smart cards have over 180 different exam questions. What separates this resource from all overs is that the exam questions include detailed mark schemes which cover all 3 assessment objectives. All assessment objectives are clearly identified within each mark scheme. Students must develop the skill of being able to identify which assessment objective is applied to each command word/question over the 2 year course! These were designed to allow students to learn at their own pace and importantly build routine into their work when answering exam style questions. Many students plough through an answer without considering the demands of the question and where maximum marks might be achieved. These tutorials provide expert advice on how to answer exam questions. The tutorials give advice on command words and their meaning, assessment objectives and where marks are hiding and introduces a 5 step plan to performing better in the exam. All whilst giving the opportunity to replay it and listen again, making it completely self-paced and independent. We hope our resource helps you to be better prepared!